The inside cover of The Art of Osamu Tezuka depicts the schematics of famous manga character Astro Boy, with notes pointing out each of the functions of his robotic body. 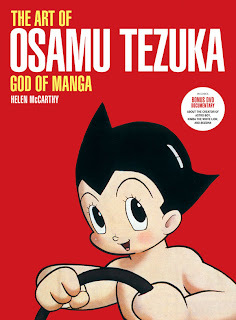 It is fitting, then, that the following 260 pages of Helen McCarthy's new coffee table-style book represent a "schematic" of the life of Osamu Tezuka, easily the most influential artist in anime and manga history. "Osamu Tezuka is not the founder of Japanese animation," reminds Katsuhiro Otomo (Akira, Domu) in the book's foreword, but he most certainly was the single greatest influence on its evolution. The manga artist-turned animator created countless unforgettable characters (including the titular characters of Astro Boy and Black Jack) and revolutionized the post-war animation industry. Thus, for fans looking to the past for evidence of where anime evolved from, all roads lead to Tezuka. The Art of Osamu Tezuka is at once a celebration and an analysis of this star-studded career, debunking myths about the artist's influence while emphasizing the all-important changes that he did make to Japan's anime and manga culture. 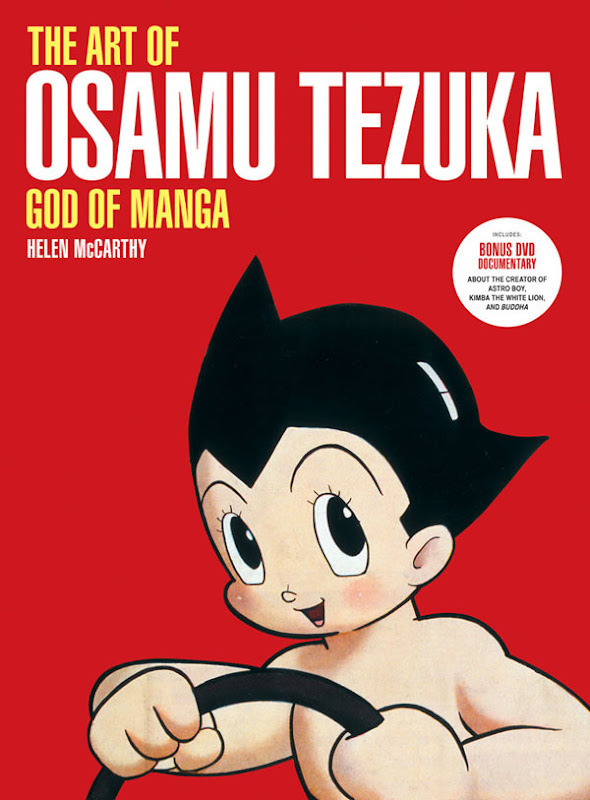 The first chapter depicts Tezuka's young life before his debut as a major comic artist, beginning (delightfully) with a photograph of the boy at only one year old. This unique window into Tezuka's early life shows fascinating insight into later works in his career, though McCarthy's assumptions regarding childhood influences on his art are certainly debatable. Most interesting of all, though, are the doodles from Tezuka's elementary school days, which include some characters (like Hyōtan-tsugi) who appear frequently in his adult works. Chapter two features an encyclopedia of Tezuka's "Star System" — his unique way of grouping his characters into an "acting troupe," with different players playing different roles in different stories. While this list naturally includes big stars like Astro Boy and Rock Holmes, it also includes a lot of lesser-known characters such as Geta (Ayako, Rainbow Parakeet) and Notaarin (Metropolis). Later chapters each focus on a decade of Tezuka's life, beginning with his debut of Ma-chan's Diary in 1946 and ending in the late 1980s with the artist's death. Throughout, McCarthy provides descriptions of what was going on during each decade of Tezuka's life, detailing — through full-page photos and brief sections of text — his struggles and triumphs in both his professional and personal life. Then the chapter moves to a title-by-title analysis of the major works of that decade. Some are notably left out (including many Vertical releases such as Apollo's Song and Ode to Kirihito), but the analyses, often brief, provide valuable insight for anyone looking to plumb the depths of the Tezuka catalog. Still, McCarthy chooses to spoil the endings of some series, which may disappoint some Tezuka fans hoping to track down these anime and manga themselves. Included in the back of the book is a subtitled documentary entitled Osamu Tezuka: The Secret of Creation. The slightly odd 45-minute video, produced by Japanese television network NHK, follows a TV crew as they document the day-by-day schedule of the manga master, complete with charming moments of humanity that we rarely see through all of the discussion of the man's artistic achievements. The video (even though it was produced independently of the book) has an incredibly authentic atmosphere that serves as a fantastic capstone to McCarthy's humanization of Tezuka throughout her book. It might miss a few steps here and there, but overall The Art of Osamu Tezuka is an absolute joy for Tezuka fans old and new. At once an encyclopedia of Tezuka's work and a narrative journey through his incredible life, McCarthy's guide is an inspiring examination of the artist's impact on anime and manga. With its wealth of fascinating information and the added value of The Secret of Creation, this is a book that belongs on any Tezuka fan's bookshelf — or coffee table for that matter. This review is based on a hardcover retail copy purchased by the reviewer.